As you may have noticed, I haven't been posting any song analysis for a while. That's because I've been compiling them into what's become a series of books called Deconstructed Hits. The first 3 books in the series are now available and include Deconstructed Hits: Classic Rock Vol. 1, Deconstructed Hits: Modern Rock & Country, and Deconstructed Hits: Modern Pop & Hip Hop. 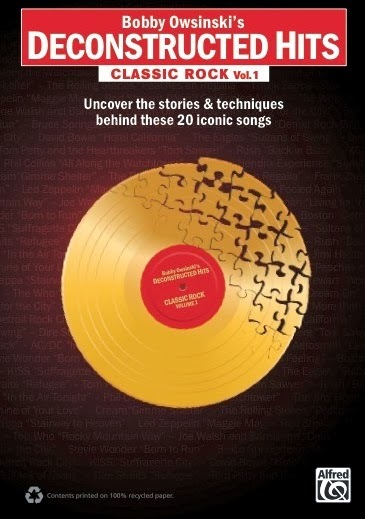 Each book contains the stories and techniques behind 20 iconic songs from a particular music genre, covering everything from basic song facts to song form, arrangement, production and sound. Here's an example from Classic Rock Vol 1 - AC/DC's "Back In Black." "Back In Black" is by many accounts one of the greatest hard rock songs of all time, and it’s the title track from AC/DC's seminal Back In Black album, an album that’s one of the best sellers of all time. This was actually the 6th album by the band, but the first without singer Bon Scott, who had died suddenly, causing the band to briefly consider disbanding. With the newly hired Brian Johnson as their new lead singer and lyricist, and Mutt Lange (who had previously on their Highway to Hell album) set to produce, the band was soon to reach heights that no one could have anticipated. What most people don't know is that Back In Black is the 2nd biggest selling album of all time, with 49 million copies sold world-wide (22 million in the US alone). As you can see, there’s basically only two sections - a verse and chorus. The solo happens over a verse, and a different guitar line with a variation on the chord changes of a verse is used to change it into a bridge. The lyrics never feel forced in the song and they feel good as their sung thanks to their natural rhythm. They’re in many ways a tribute to previous singer Bon Scott dying as not so much the tragedy of his death, but a celebration to carrying on while honoring him. In their typical style, AC/DC keeps this song as pure as possible with almost no overdubs except the lead guitar. First of all, listen to the turn around between 8 bar phrases during the solos. It's still a verse, but it sounds different thanks to this slight change of bass and rhythm guitar. There's nothing added to the 2nd verse to develop it, which is unusual, but it still works great, as do the background answer vocals added to the last chorus. The other thing that's interesting is the dual count off, first with a guitar and then the high-hat. Countoffs are almost always cut off from a song (they're the sure sign of a demo), but here it just adds to the live feel. The sound of this record is great - big, pristine, very real and in your face, but there's a lot more going on beneath the surface than it seems. Although the record seems bone dry, the rhythm guitar has a long reverb tail that only appears on the same side (the right channel) and the lead guitar has a short double that's panned to about 1 o'clock of the rhythm guitar side. Brian Johnson's vocal is doubled, but the second voice is not at the same level and instead just there for a bit of support. The snare has a nice room ambiance, but also has an ever so slight bit of delayed reverb added to it as well. Angus Young's solo guitar is overdubbed and placed up the middle. Listen Up:To the vocal countoff way in the background before the song begins. To how far behind the beat the snare drum is played. The the vocal double being slightly different on the last “Back in black’s” in the choruses. To how the guitars are actually more clean than they are distorted. "Back In Black" is such a band oriented song that except for a few extra parts for support, what you hear on the record is exactly what you hear live. In order to pull this off, the band has to be exceptionally tight during the recording, which AC/DC certainly is. Finally, listen how far behind the beat drummer Phil Rudd is, giving it that tension that the song needs to really work well at that tempo. You can read additional excerpts from Deconstructed Hits: Classic Rock Vol. 1 and my other books on the excerpt section at bobbyowsinski.